Since joining the Nashville Predators full time in 2008-09, Pekka Rinne has consistently demonstrated why he is among the best goaltenders in the world. He has great size, he has tremendous mobility and he makes timely saves. These qualities, among many others, earned him a seven-year, $49 million contract in 2011. 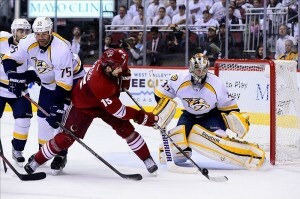 So, what happened during the 2012 playoffs against the Phoenix Coyotes? For the first time in his relatively short playoff career, Rinne found himself staring across the ice at arguably the hottest goaltender in the National Hockey League: Mike Smith. Rinne is 29 years old, six-foot-five, 209-pounds. Smith is 30 years old, six-foot-three, 211-pounds. Every goalie wants to prove more than anything that they are better than the guy at the other end. They will do whatever it takes to win the game and gain the mental edge over the opposition. In the case of Rinne versus Smith, Rinne looked like he was trying to do too much to stop the puck. Essentially, the opposite technical traits to Smith’s patient butterfly style. Where Smith shortened his depth in the crease by playing in the blue paint, Rinne was found aggressively challenging shooters in the white paint. Consequently, he would often have to move at greater distances to get set for a shot if a pass was made or the puck took a deflection onto an unsuspecting stick. This poses a tough challenge for bigger goalies because they naturally open up larger holes between their legs or under their arms while moving. As a goaltending coach, we try hard not to generalize. Each goalie is unique and there is no doubting that. However, there are some characteristics that you can find in goalies, especially if they come from a certain part of the globe. For the most part, Rinne plays at the top of his crease and around the very beginning of the white paint. As a big goalie, you would think that this is beneficial. In some cases, it is; however, there are times when it isn’t. It is important for goaltenders to be smart with their movements (also known as being economical or efficient). As a general rule, the farthest distance a goaltender is ever taught to move is post to post,which is about six feet. Any distance farther than that is considered too much because it hinders their ability to make any secondary movements fast enough. The traditional school of thought is that big goalies, in general, do not move well. Rinne is probably the exception. He moves exceptionally well for a goalie his size. What Rinne has yet to demonstrate, however, is that he can consistently use his size to his advantage. In some cases, it does mean being aggressive. But, it also means staying a little deeper in the crease, depending in the situation, and anticipating the possibility of two, three or four chances. It also requires a goaltender to determine where players are without the puck because they may ultimately be the higher threat for a scoring chance. If these players are at a farther distance than six feet, it requires more effort to get in a proper position to not only make a save, but control the rebound. As a Vezina Trophy candidate, up against a goaltender who many would argue deserved a nomination over him, Rinne had a lot to prove in a heads up battle versus Smith. Rinne and Smith treated hockey fans to great goaltending during the regular season and their time together in the playoffs. I really do hope they paid attention during their series because they have a lot to learn from each other. For Rinne, it could have been the duel that leads him to adapt a style more suited to his size, for the better, and not the worse.